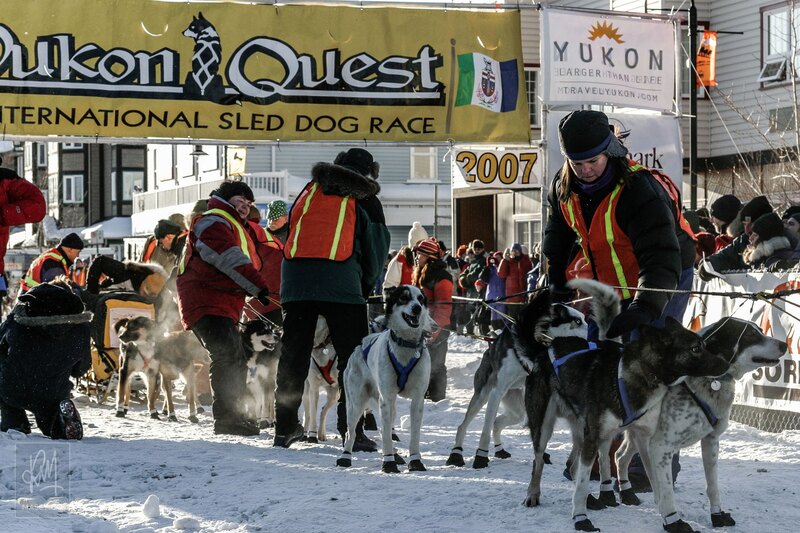 2007 Yukon Quest – Good times! I think it's pretty safe to say that I've just returned from what was probably one of the best weekend adventures/getaways I've had since arriving in Canada. Granted it was a damn expensive one considering how much the airfare was for a 3-night frolic in the frozen north, but I'm confident that Ryan and I squeezed every bit of value we could out of our time up in Whitehorse. 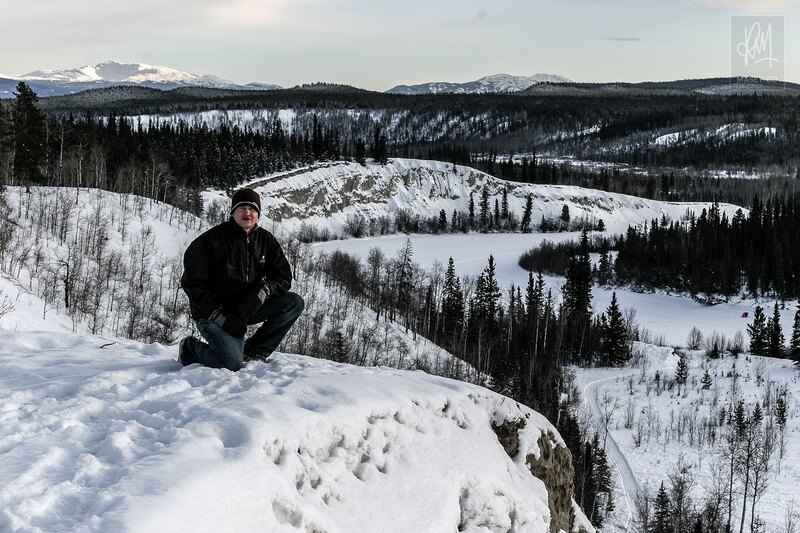 As I touched on a couple of weeks ago, I tagged along with Ryan on one of his business trips on the weekend to Whitehorse, the beautiful capital of the Yukon. Boston Pizza were one of the main sponsors of this year's Yukon Quest so he thought, as Marketing Manager for the company in that part of the Canada, it would be good for him to head up there and put in a bit of an effort to promote the Whitehorse store while there was a nice big influx of hungry people in town. 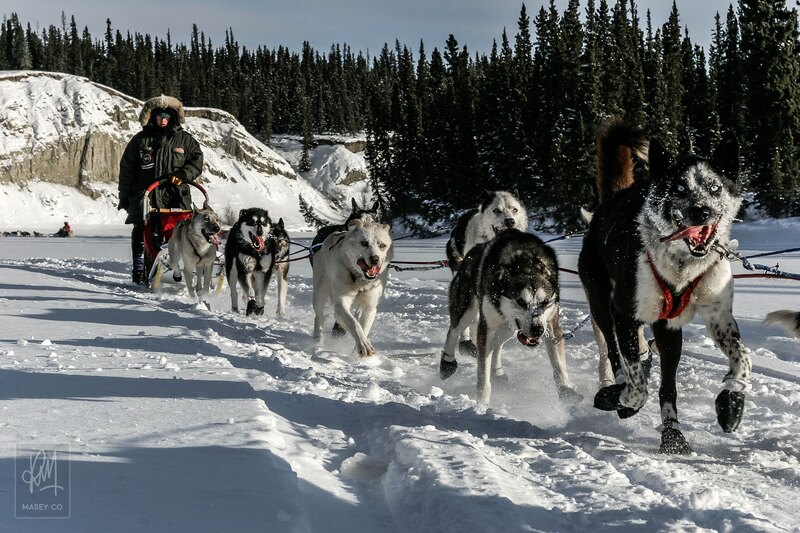 Dog sledding is always something I have wanted to see, and to photograph, so the opportunity of joining him on the trip was one I couldn't let pass by. We kicked things off with a mid morning flight aboard Air North which delivered us in Whitehorse in a little over two hours. For a small airline I was pleasantly surprised with the on board service and overall comfort of the flight. The first thing to do once we touched down was organise a hire car. We knew it was going to be cold outside once we left the relative comfort of the terminal building as our pilot had given us the skinny on expected temps for the day, shortly before our descent. We got a real sense for how cold it was likely to be when the rental company representative informed us that the keys were already in our car and the engine was running ready for us to take off in – a crazy thought for this little Aussie from the sub-tropics. It actually wasn't that bad out in the fresh air with the temp hovering somewhere around -8c. 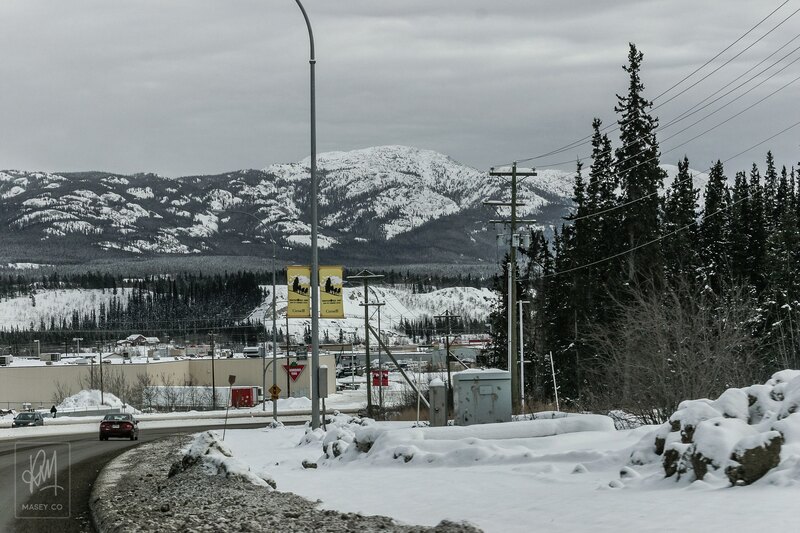 We headed straight down from the airport into the down town area in search of our hotel for the next few nights – the Best Western Gold Rush Inn. Welcome to the Great White (frozen) North! It seemed that we had arrived a little early as our room wasn't ready and we were told to go find something to do for 45 minutes or so. 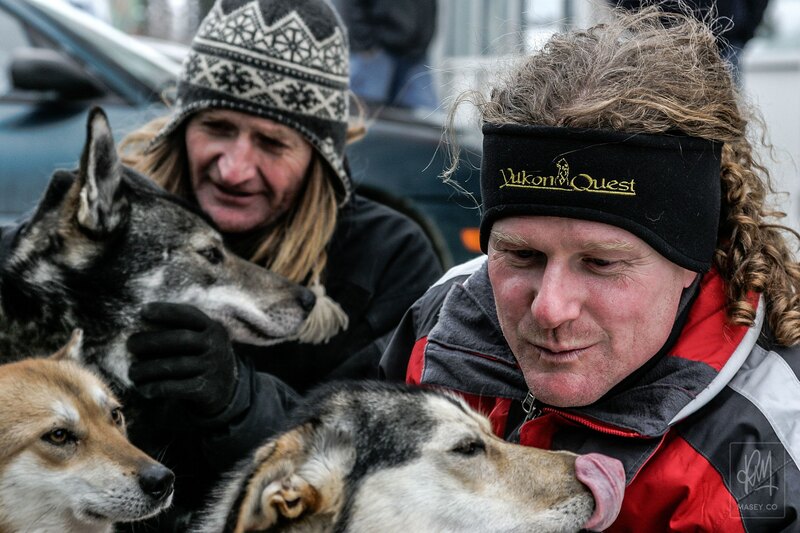 Having been to Whitehorse before on a previous business trip, Ryan knew a few people involved in the organisation of the Yukon Quest, so we took the opportunity to head down to the official race office to say hello to Stephen Reynolds, the head honcho in terms of the Whitehorse/start sector of the race. Stephen was really friendly, as was pretty much everyone I'd had contact with in town up to this point – a good sign for the rest of my trip. Ryan got all sorted with details of a sponsors dinner that evening with Stephen and we also discussed plans to head out to follow the race teams post-start on Saturday afternoon – a prospect that I was pretty excited about. Back at the Best Western we were told our room was ready, so we headed up to the top floor in the elevator, rounded a few corners in the long corridor layout of the place and eventually found our room complete with a woman still stripping down the beds left by the previous occupants. I left Ryan to get to the bottom of the mix-up, choosing instead to grab some more warm clothes and hit Main Street to check out the shops etc. There wasn't a whole lot to it as the main strip isn't all that long or densely populated with tenants, so I ended up walking back past the hotel to the end of the street and to what appeared to be the border of the down town area to a park that led up to a steep ridge. I didn't have a lot else to do and the limited light was starting to fade so I ended up hoofing it through knee high snow up the steep slope to the top of the ridge line where I was a little surprised to find the edge of the airstrip we had touched down on earlier. If nothing else, my hard work making it up the slope was rewarded with a rather beautiful vista of the town streets. Heading back to the room I ran into Ryan briefly before he headed off for his sponsors dinner. I showered and attempted to hook up with a weak wireless signal provided by the hotel for checking email etc on my laptop. It wasn't long before hunger go the better of me and I wandered up the street to grab myself a burger. With a big day ahead of us tomorrow we called it a night pretty much as soon as Ryan got back from his function. As the morning rolled around, we got up and headed down to the in-house restaurant for some sausages, eggs and hash browns for breakfast. It sure wasn't anything fancy as far as breakfasts go, but boy did it hit the spot. 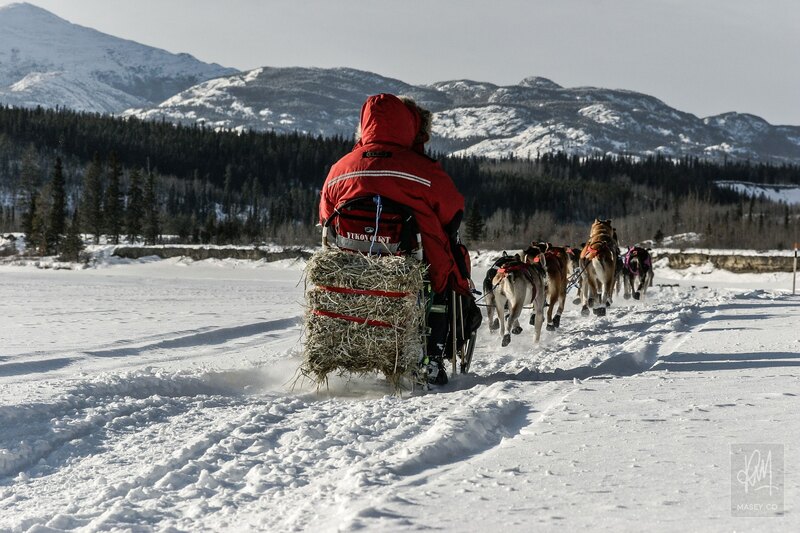 First order of the day was to attend a promotional visit by one of the teams participating in the Yukon Quest at the Boston Pizza restaurant on the other side of town. We probably got there a little early, but it gave us a little bit of a chance to acclimatise to the decidedly chilly atmosphere that surrounded us. With a little bit of breeze gusting around, it felt around -16c, but was no doubt not anywhere near that bad. 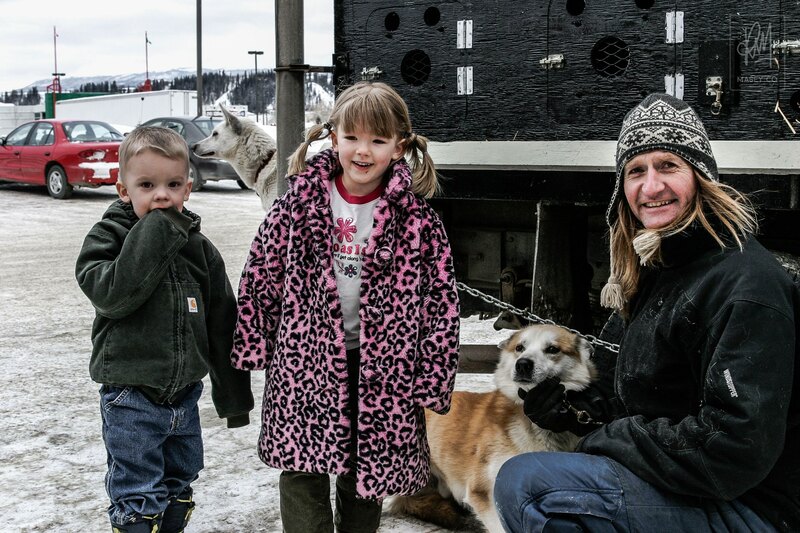 Anyway, around 11am one of the Yukon Quest mushers, Dawson City's Peter Ledwidge and his wife Ann (who doubles as his dog handler) arrived in the carpark area at the front of the store, and proceeded to unload and hook up to the side of their vehicle, their full compliment of racing dogs allowing the public to come up and say hello and pat the dogs. 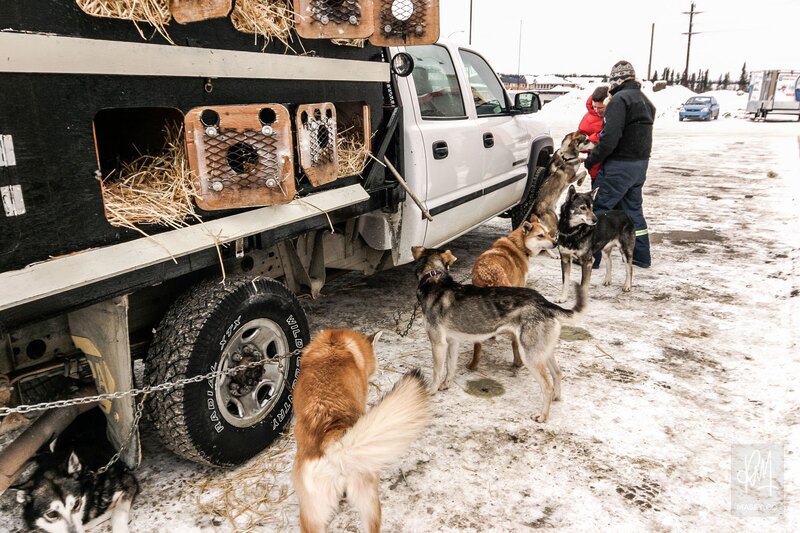 Peter's pooches emerged from what looked like a straw-lined chicken coop on wheels! 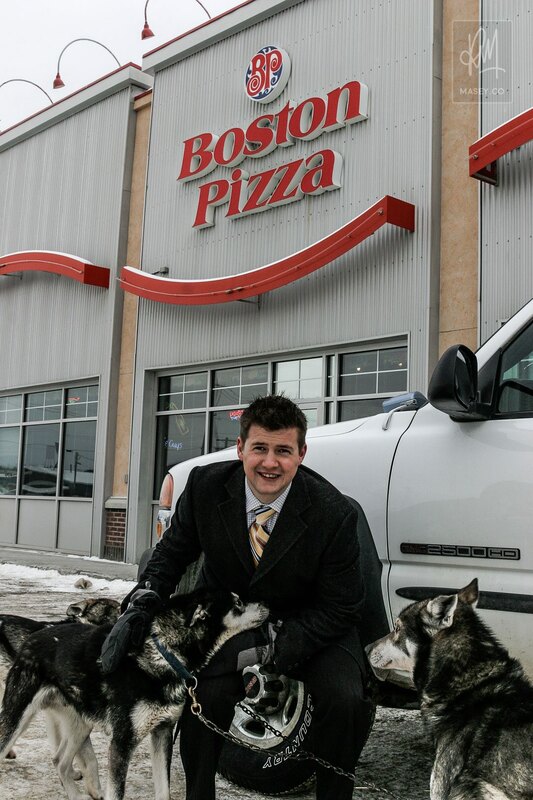 Good old publicity shot for Ryan in front of one of his Boston Pizza stores. I'm not sure exactly what I was expecting in terms of visual appearance of the dogs, but somehow in my head I expected the huskies (mostly cross-breeds of some kind in this instance) to be all big and fluffy like the pampered leashed ones you see prancing through the streets of Yaletown on a weekend. 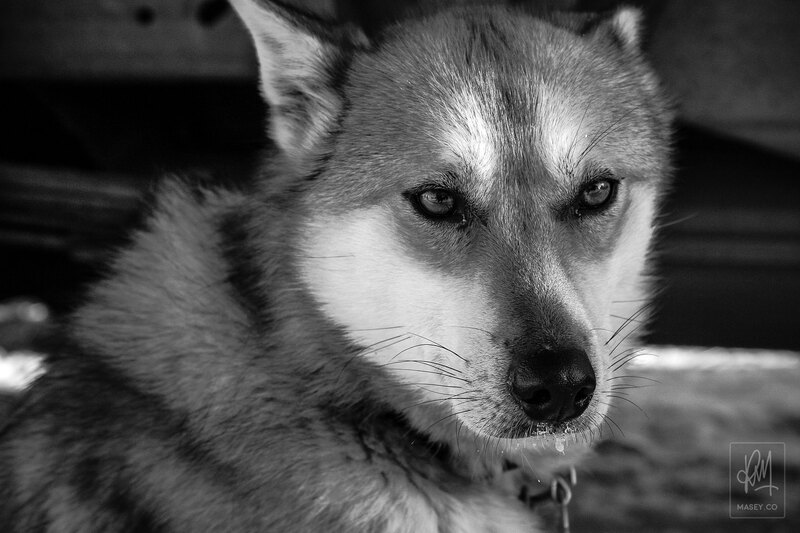 But no – these huskies were lean, almost short haired and visibly athletic. Not what I expected, but every bit as gorgeous just the same. I couldn't resist stepping up for a cuddle of my own. After milling around in the cold with some locals, a reporter or two, Stephen (the race organiser who had popped down to say hi) and a few of the Boston Pizza staff members, Ryan invited Peter, Ann and their daughter Emilie into the restaurant for lunch. 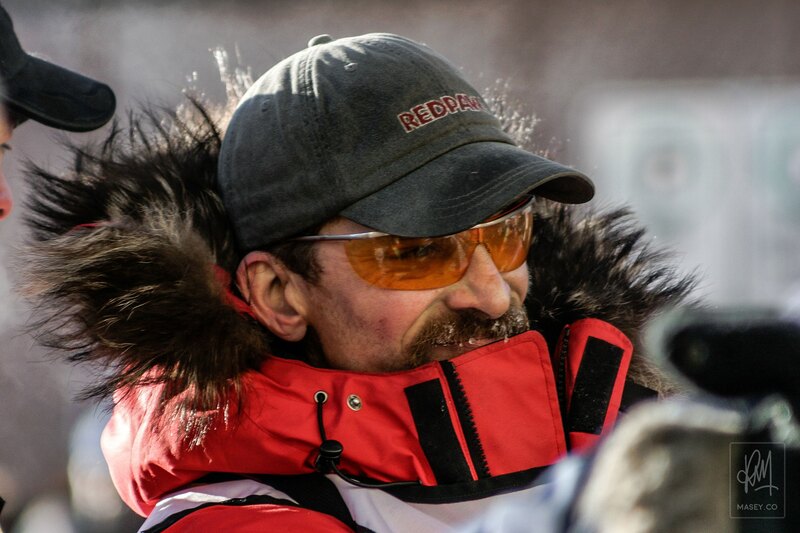 This gave us a great opportunity to have a casual chat with Peter about the sort of conditions he expects to face over the next couple of weeks. Peter and Ann are such lovely people and I really wish them all the very best of luck over the coming days of racing. 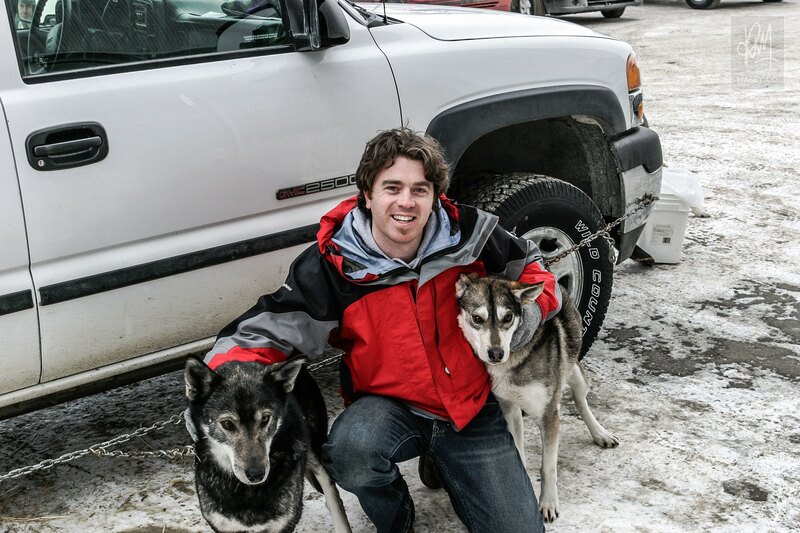 Musher Peter Ledwidge with a couple of local kids who came down to Boston Pizza to see the dogs. Stephen says g'day to one of the dogs. 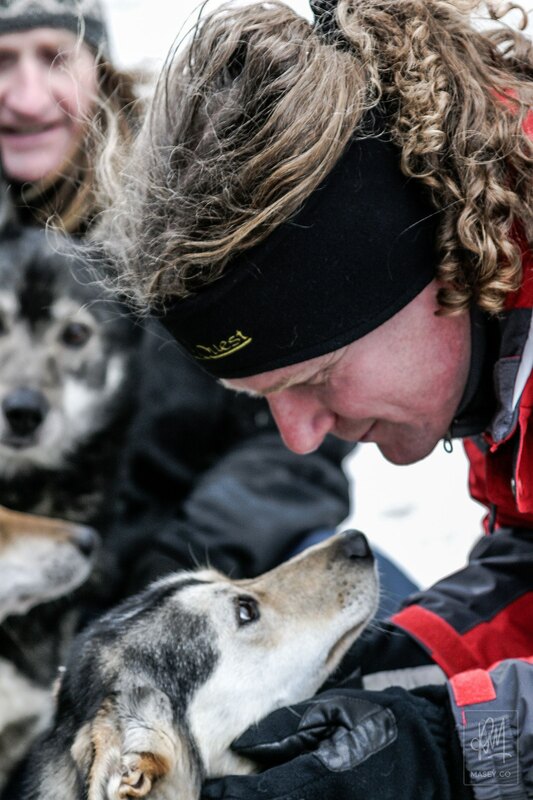 Both Peter and Stephen spend some special time with their K9 pals. With full bellies Ryan and I headed back to the hotel and changed before venturing into the cold again, this time with the intentions of visiting the local brand spanking new recreation centre to mix up a little bit of business with pleasure. Ryan met with Bob Baxter, the friendly owner of the local Yukon Brewery to discuss some possible local promotions for the label in the Boston Pizza restaurant. With Ry's final bit of "business" out of the way for the weekend, we hit the running track and the gym in an attempt to get some exercise under our belts. I have to say I was blown away by the center and it's features. We're talking multiple ice rinks, synthetic grass fields for indoor soccer, full sized basketball courts, Olympic sized pool, an elevated and quite scenic running track which looked down over all the other playing surfaces and a good sized gym. I realise that they are about to host the 2007 Canada Games in the next couple of weeks, but it's amazing that such a little town has been gifted with such a huge modern complex – lucky buggers! 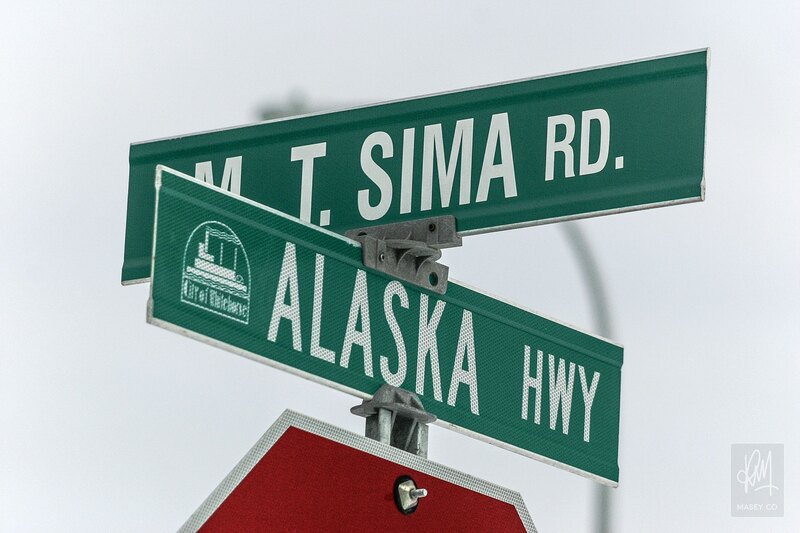 There was no mistake which way was the way from Whitehorse to Alaska. I'll get there one day. 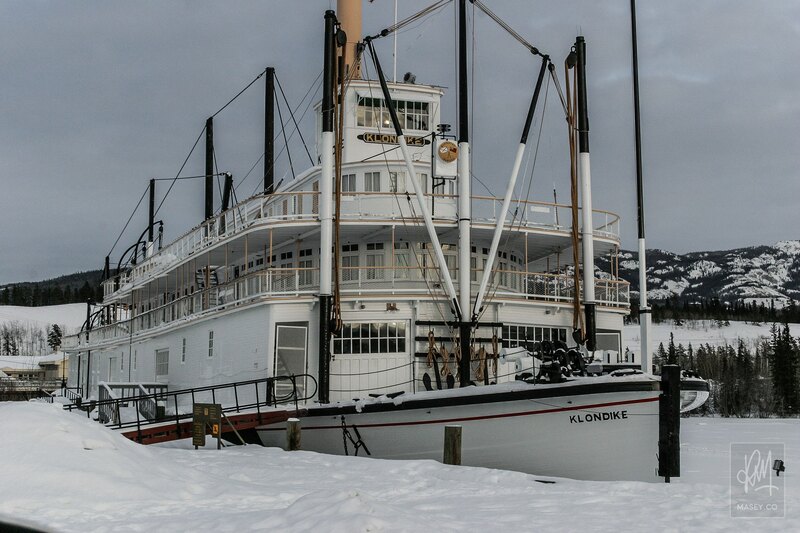 The famous SS Klondike - a sternwheeler used extensively for transportion throughout the Yukon in the 1930's and 40's. Back at the hotel we freshened up and then headed downstairs to the bar next door – a place called "Lizards". Understandably given the early hour, it was pretty quiet so we just had a bite to eat and a beer and then moved on further down the main strip to the first place we found that looked like it was half decent. We managed to somehow score ourselves a full booth in a lively little bar even though the place was packed to the rafters. We used the comfortable situation to sit back, relax and enjoy a few pints of the local "Yukon Gold" – a very tasty drop indeed. At about 11pm we headed back towards our hotel, along the way noticing that "Lizards" had filled up substantially. We ventured in and joined in the party. Ryan ran into a mate of his, Andrew, who I think he may have had some business dealings with on his last trip to Whitehorse last year. Andrew is preparing for a couple of big weeks coming up as he's the acting Sponsorship Manager for the Canada Games I mentioned earlier. Towards the end of the night we also were introduced to Heidi, an executive representative for another of the Yukon Quest's main sponsors – Westmark Hotels. It was great meeting up with her the night before the race as, unknown to us at the time, Ryan and I would be spending a good deal of the day tomorrow with her as well. 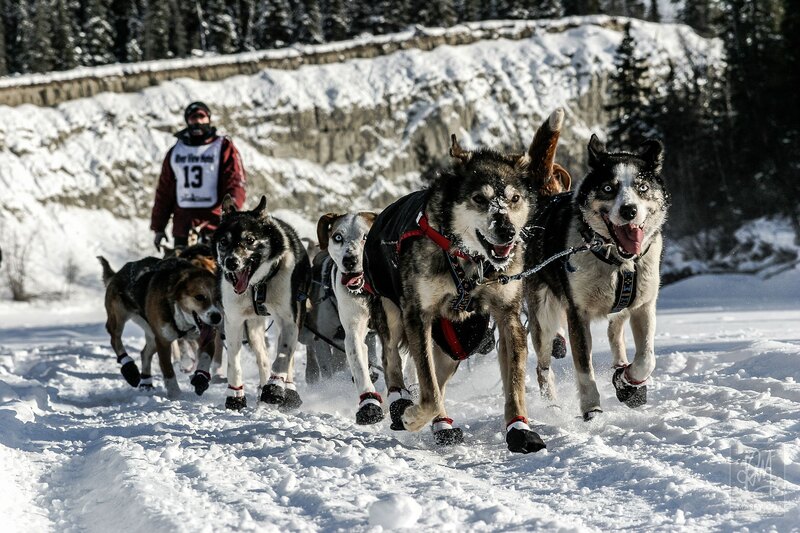 2007 Yukon Quest - Race Day! I can't say that rising early yesterday morning was all that easy, but somehow Ryan and I made it down to the end of Main Street where the 28 competitors of the race were being let go at 3 minute intervals. 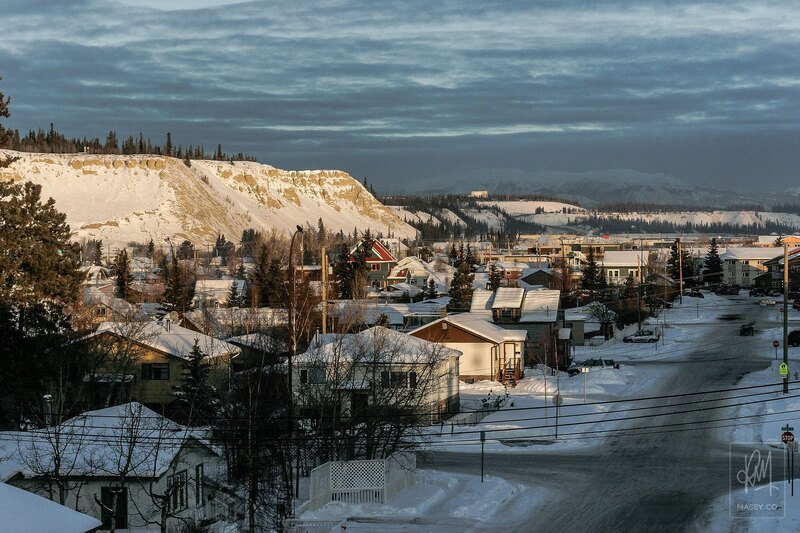 Early morning sunrise over the town of Whitehorse, the capital of the Yukon. 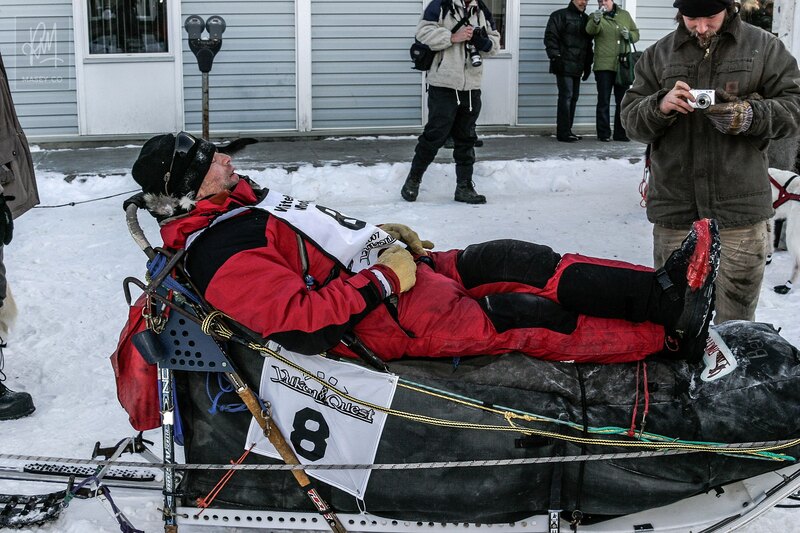 Musher Tom Benson sneaks in a last kip before commencing the race. 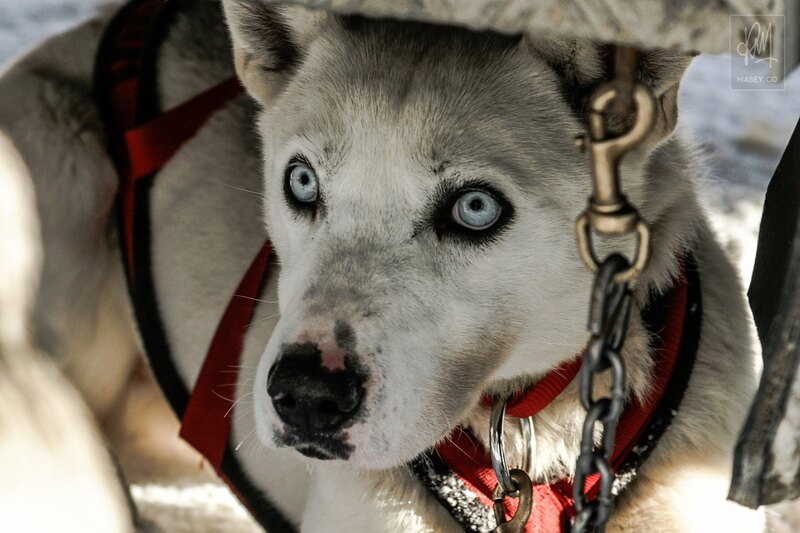 One of the many beautiful huskies lining up ready to do their bit in the race. I was obviously pretty pumped about today from a photographic point of view, so I was understandably keen to muscle my way into a good position on the barrier to the side of the starting gate. With a little bit of cunning and some good fortune, I did manage to get myself into a couple of good spots and get some great shots despite fighting with the harsh, low sunlight that was bathing the starting area. I made sure I was in a good position to capture Pete's start and we all cheered him on as he left the gate. 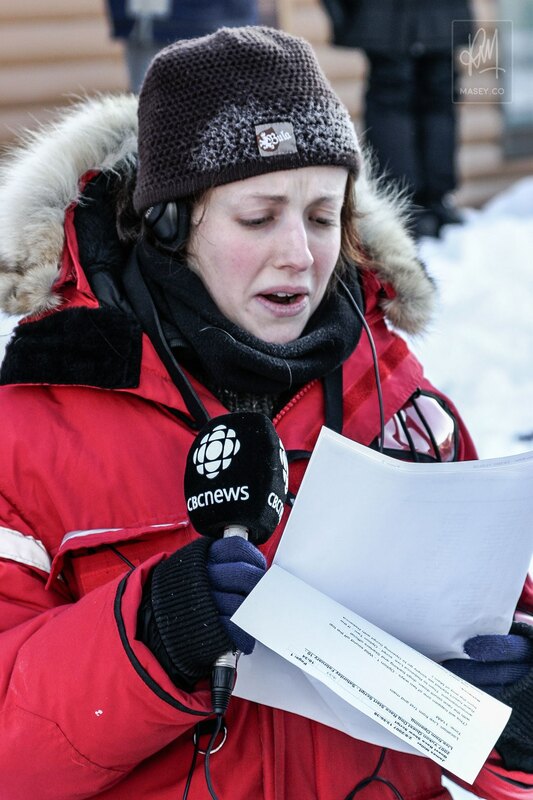 CBC News were on hand to let the rest of Canada know what was going on up here. 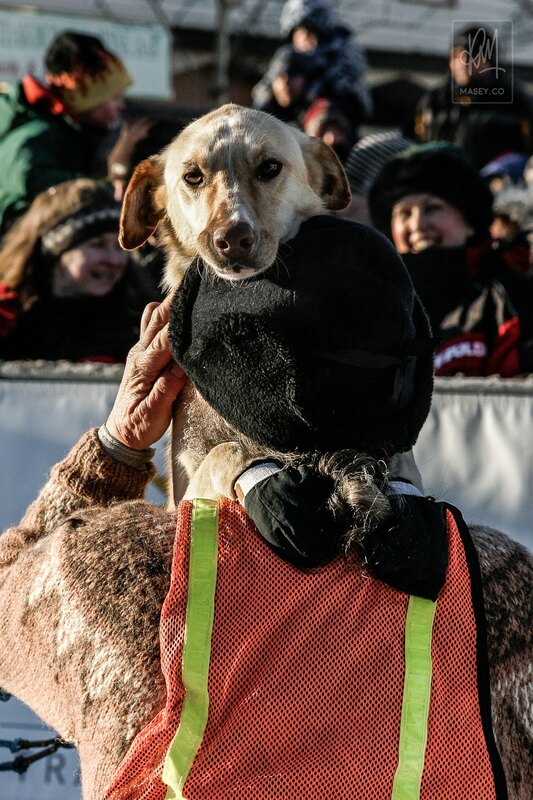 A bit of pre-race handler/puppy love. 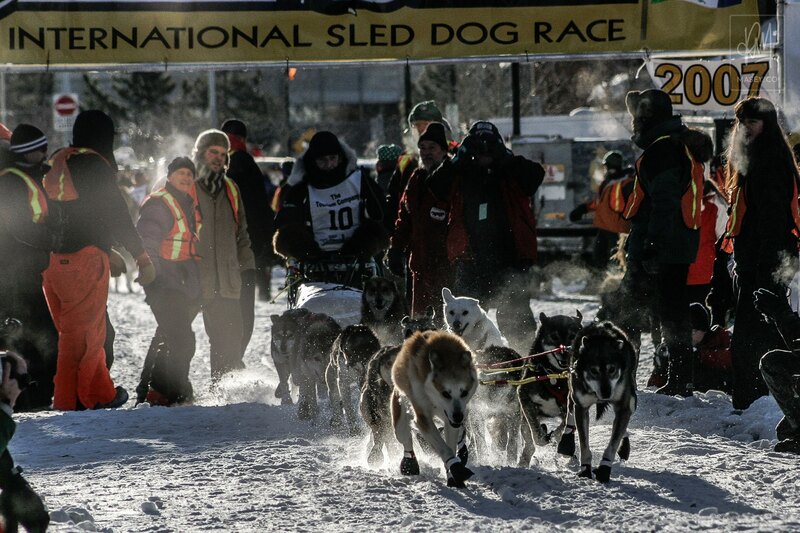 Musher Brent Sass' handlers prepare the dogs on the starting line and complete all the last minute checks. Brent's team break out of the gates in a flurry of excitement. 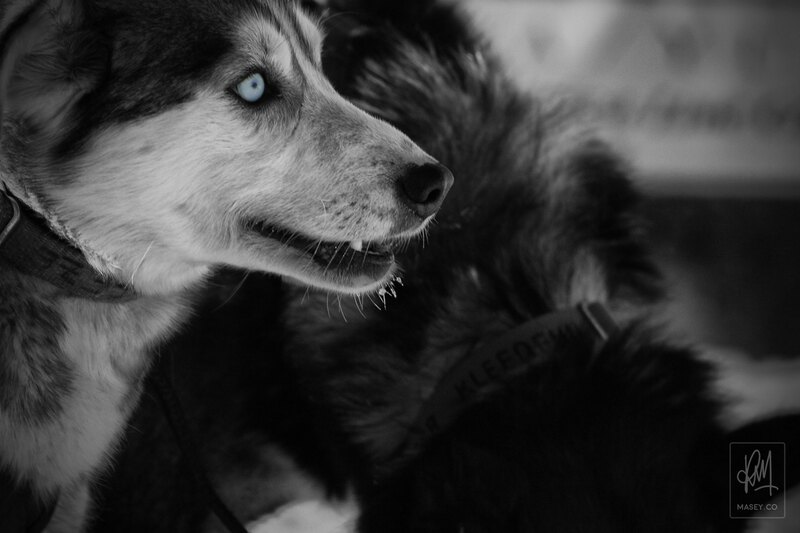 The steeley blue eyes of some of the dogs were simply breathtaking. 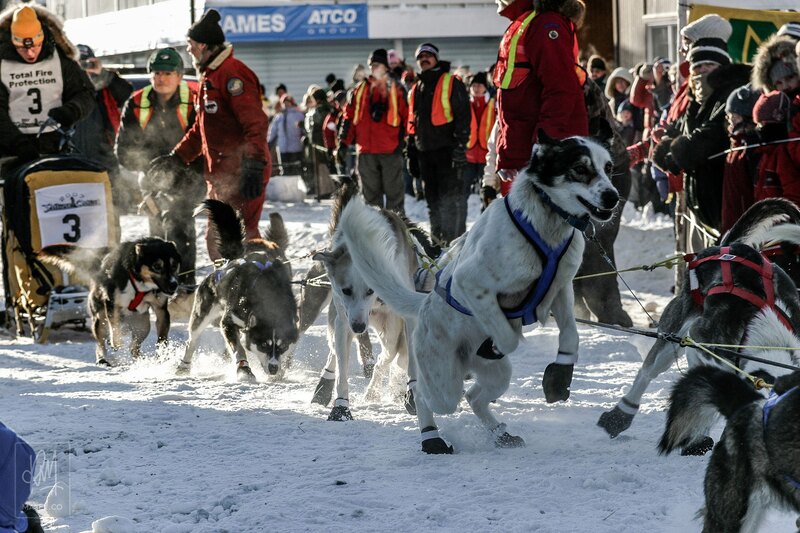 The excitement in the dogs as they were about to leave the starting gate was oh-so-evident. 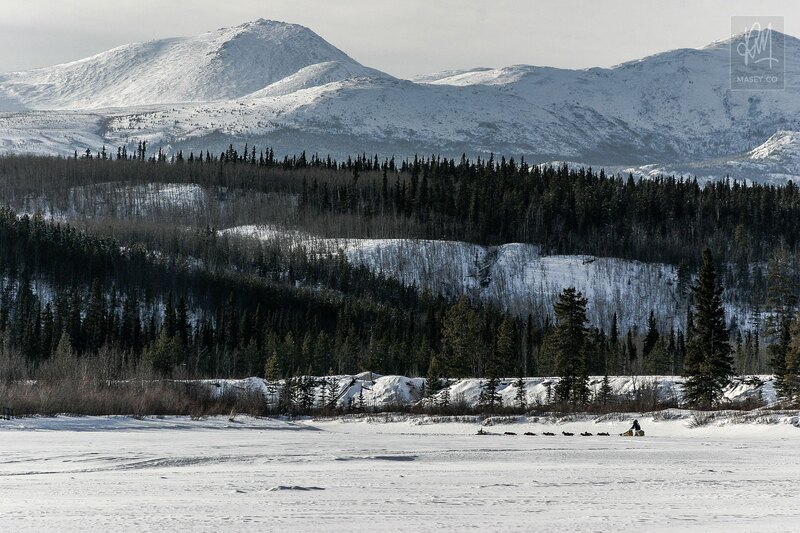 Musher David Dalton sets out on his epic journey to Fairbanks, Alaska. 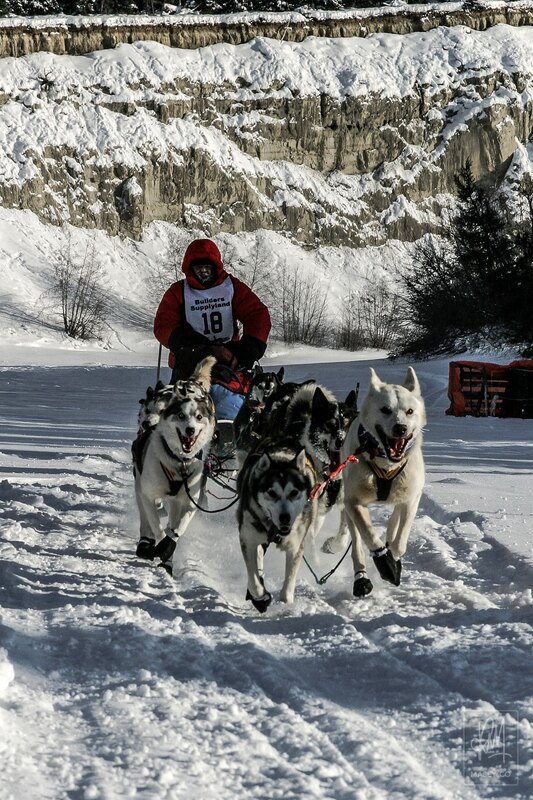 Peter Ledwidge and his handling team prepare for their turn to leave down town Whitehorse. 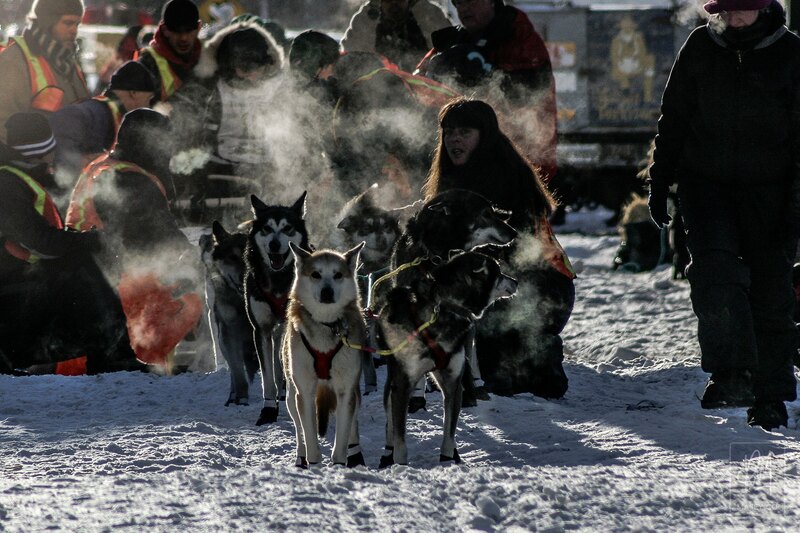 Leaving a cloud of frosted dust in their wake, Peter and his team head off. 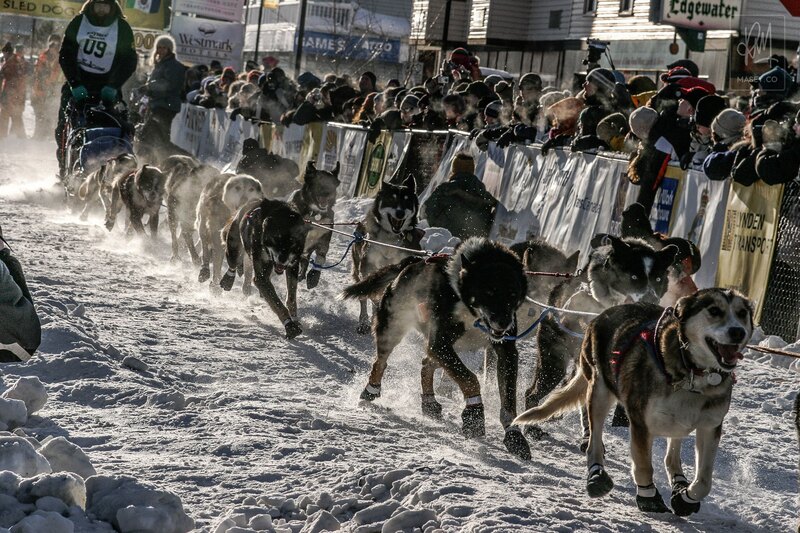 This year's race is the 24th annual run from Whitehorse to Fairbanks in Alaska (1,000 miles). 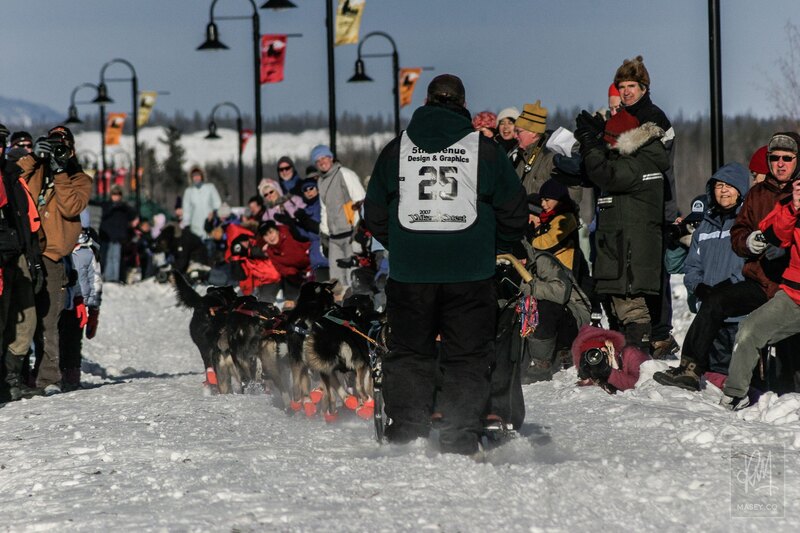 Each alternating year the course direction is reversed so that the race will commence in Fairbanks next year with the finish line being in Whitehorse. 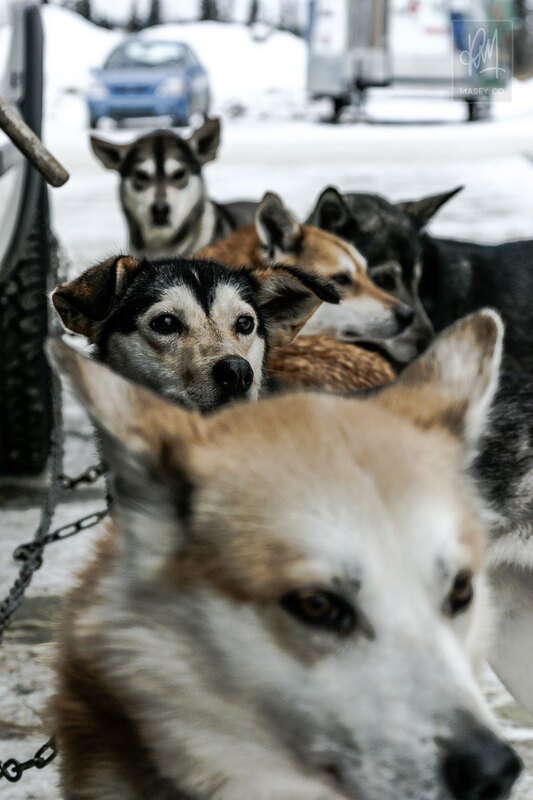 Each team consists of one musher, a sled loaded up with 250lbs of supplies, and of course 14 energetic dogs. 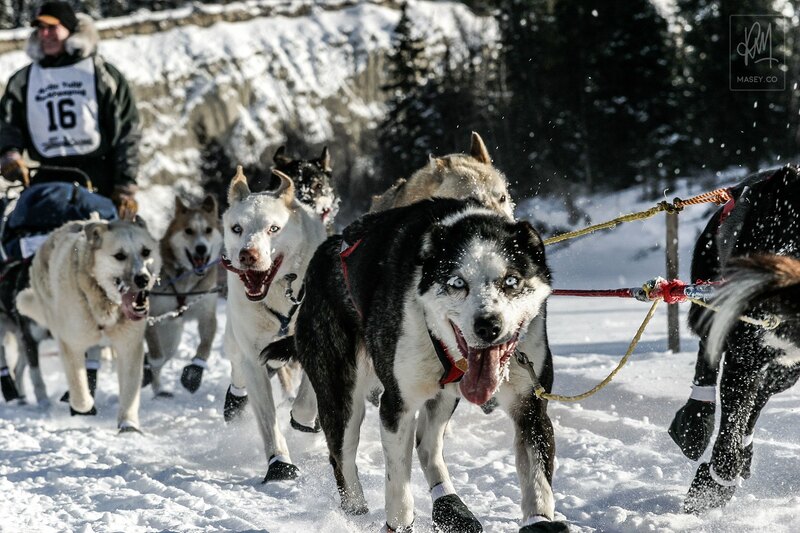 The Quest is considered the most demanding dog-sled race in the world, even more so than it's more well-known cousin The Iditarod which is run from Nome to Anchorage in Alaska. 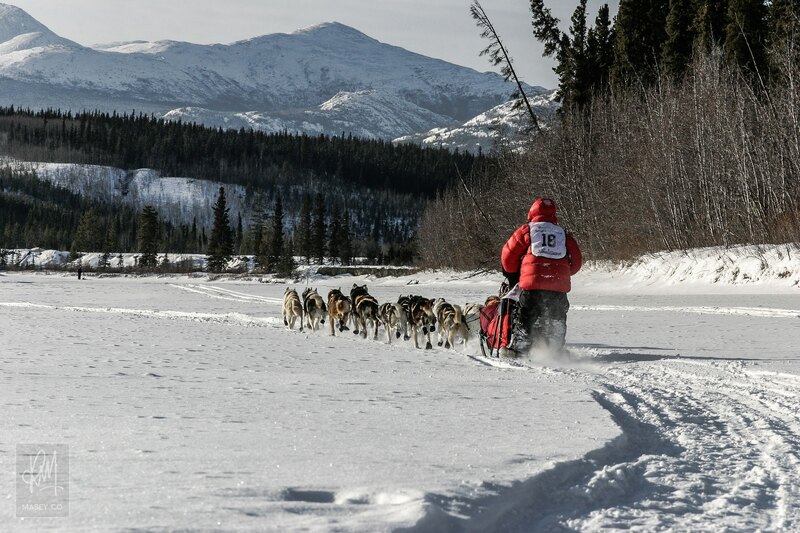 While both races are run over the same distance (1,000 miles), the Yukon Quest only has 8 scheduled stops as opposed to The Iditarod's 27 stops. 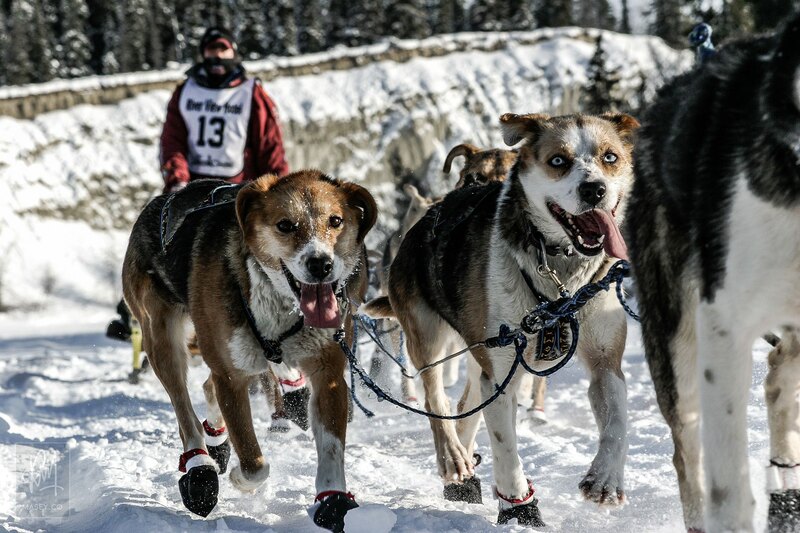 Over the course of the race, which should take competitors anywhere between 11 and 14 days to complete, each of the mushers and their dog teams will navigate the frozen Yukon River system and four mountain passes. That all sounds like a pretty brutal mix to me, but it's all extremely well managed and the health of the dogs is of paramount importance at all times. 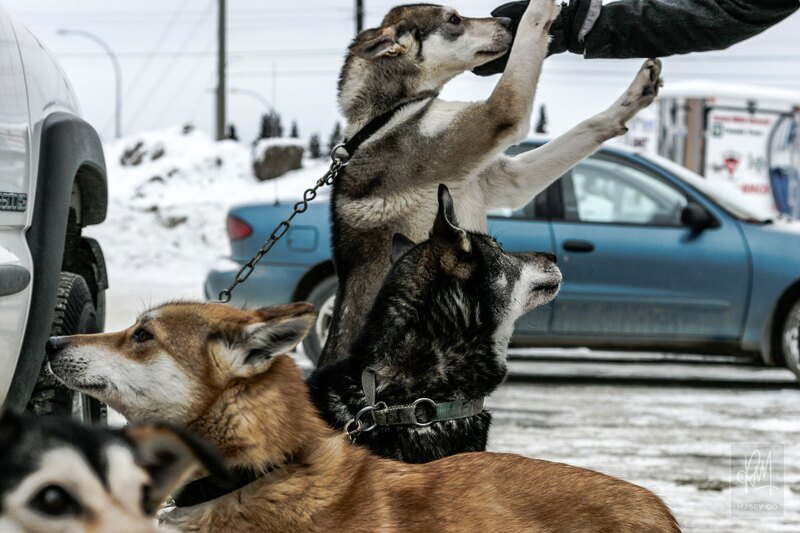 From what I gather by talking to Peter, Stephen and others, each and every dog is checked over once, sometimes twice at each of the scheduled stops at the very least by qualified vets. Two-time and current defending champion Lance Mackey was all smiles at the start gate. The local crowd cheer Russ Bybee and his team on their way out of town. After the last competitor set off, we met Steve and a bunch of the principal sponsor representatives at the bottom of Main Street and jumped into two vans which transported us out of town. We actually headed out to the "SIR North Country Ranch" (out towards the Takhini River Hot Springs) where ranch owner Rolf Schmitt hosted a little race viewing gathering for us with hot wine and cider, pastries and the opportunity to descend the bluff we arrived at, down to the Takhini River bed where we could get up real close and personal with the racers as they came through – an opportunity not available to any other members of the public... not in this section of the course anyway. As you can imagine, I was able to make good use of the amazing photo opportunities afforded to me, the results of which are shown below. 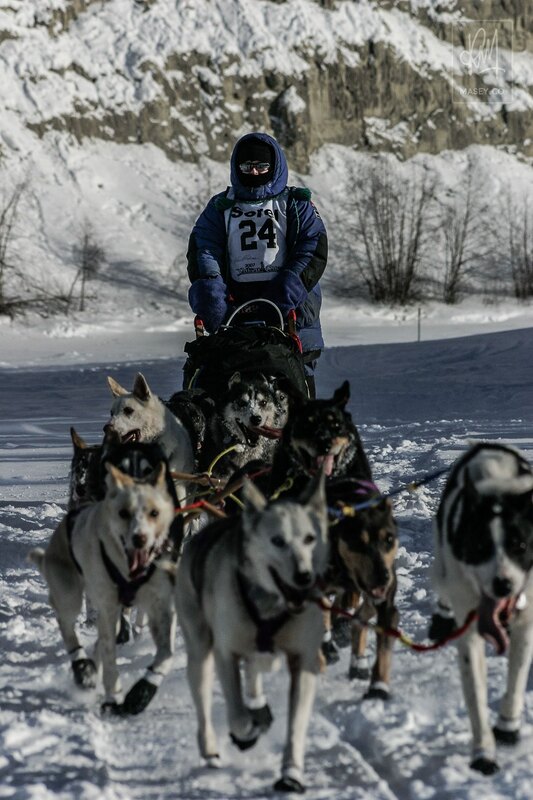 Musher Tom Benson was all rugged up, comfortable and whistling a tune to himself as he passed. 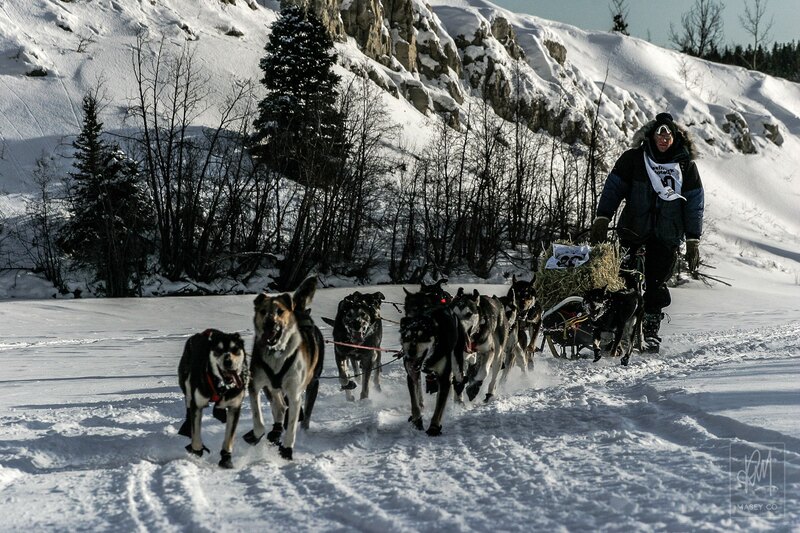 Frank Turner leads his dog team along the frozen river bed. Probably my favourite shot from my trip away. 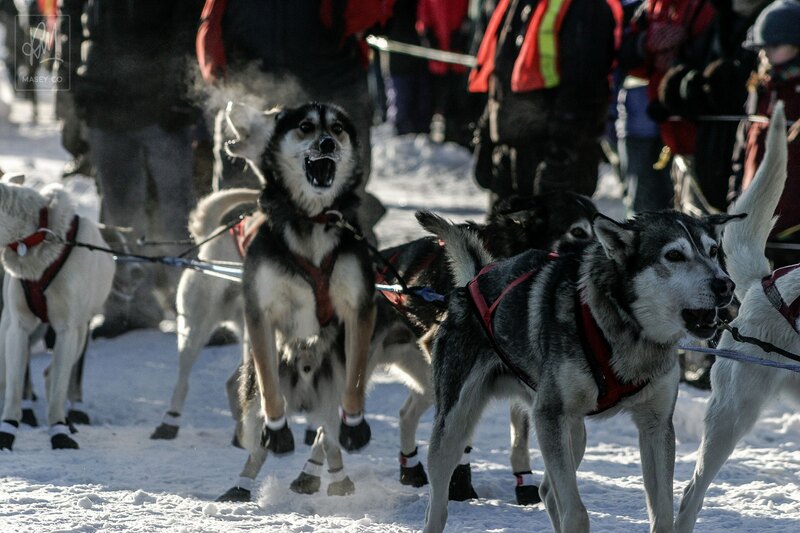 Regina Wycoff's dogs were more than happy to check me out as they passed. 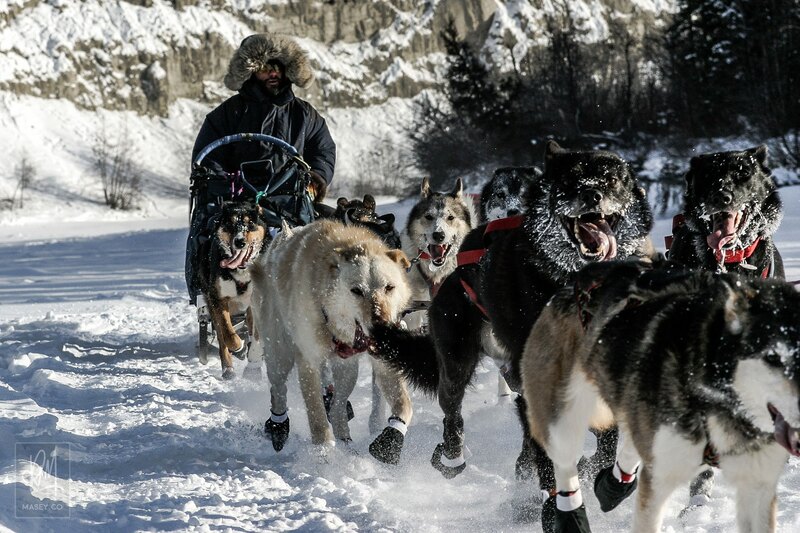 Musher Greg Parvin and his dogs were the next to pass. 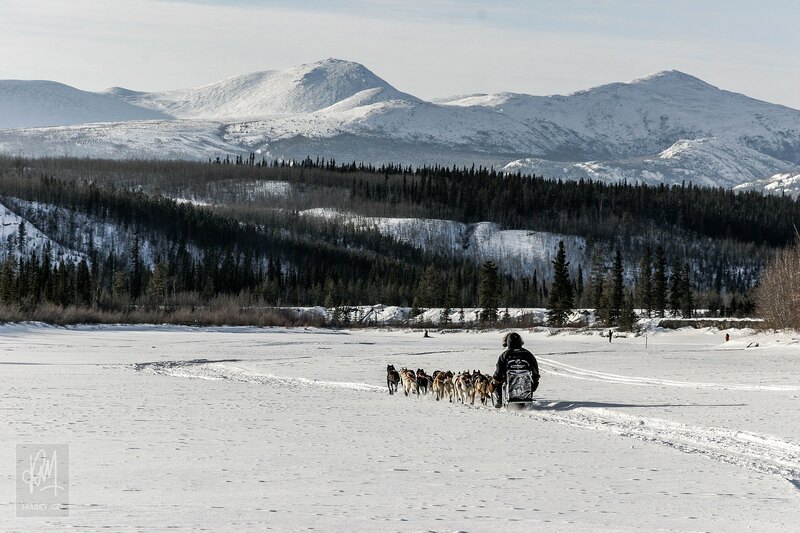 An unidentified, but more than adequately rugged-up Musher and team, is one of the last through the bend of the Takhini River. Easily the most scenic seat in the house. I felt very fortunate being able to spend the afternoon in such beautiful surroundings. 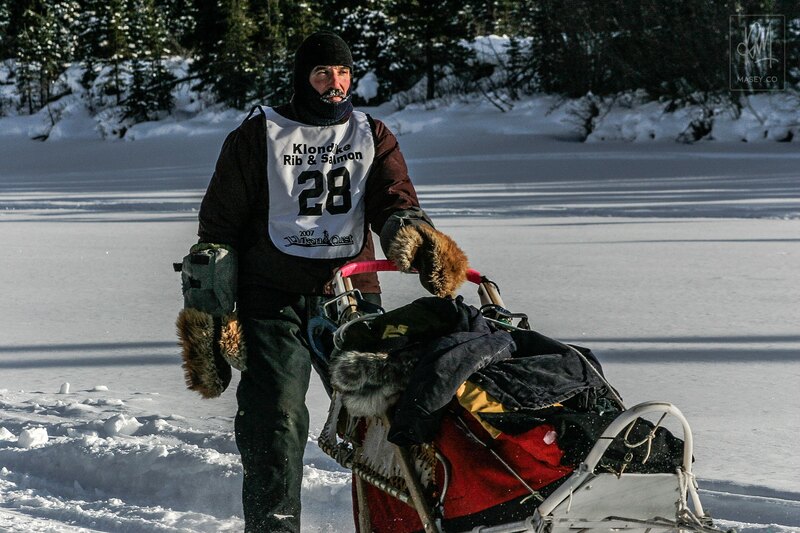 With gloves like that, musher John Schandelmeier appeared to be ready for anything. Russ Bybee and his bunch of bright orange bootied beasts. 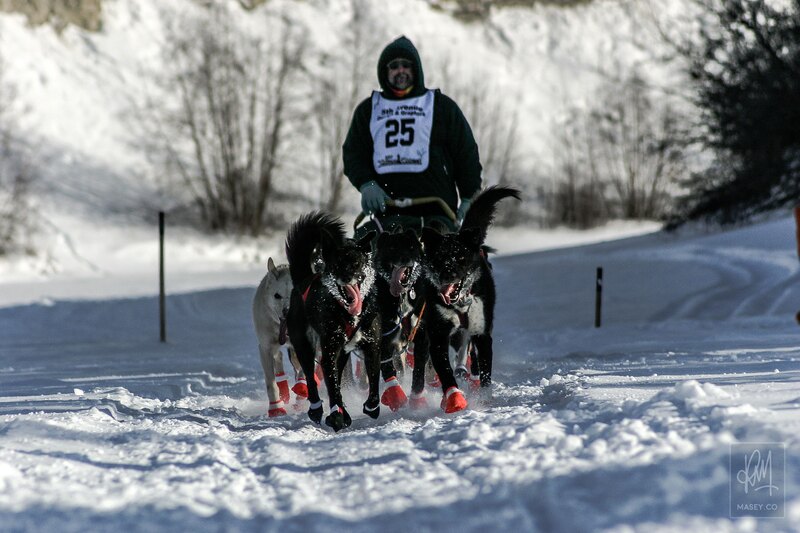 Musher JT Hessert and his dogs were the last competitors through our position. ...then I took the same photo for Ryan. Time for some beer and some pizza! 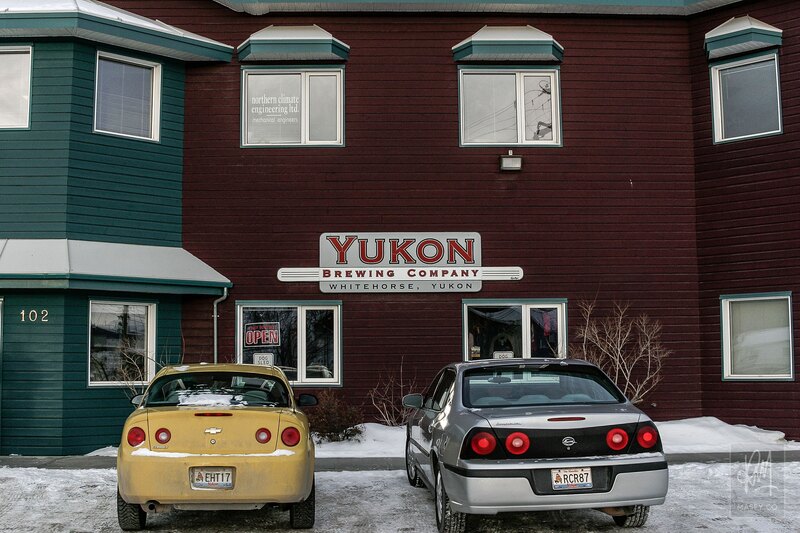 After eventually being dropped off back in town, we thanked Stephen for an amazing afternoon and headed straight for the Yukon Brewery for our brewery tour appointment. Upon arrival we were introduced to Amos, the head brew master at the micro brewery, who took us on a tour of their clean, modest set up along with a couple of small silent Asian girls and another 3 Aussies who were in town on holidays. It was all very interesting and it became very evident that Amos was pretty passionate about his work. If you're looking for a tasty drop when you swing through Whitehorse next, this is the place to go! Like all good brewery tours, we concluded back in the gift shop with plenty of tastings available across their current selection of brews. Yukon Gold – a beautiful, almost citrusy draught that I highly recommend. Yukon Red – a clean amber ale that wasn't really to my liking, but I'm told the locals guzzle it like it's water. Cranberry Wheat Ale – a seasonal ale available only in the Yukon, this tasty drop was a surprising favourite of mine. Discovery Honey Pale Ale – you know I love my "honey" brews and this was no exception being specifically made with local Fireweed honey to produce a unique nectar finish. Midnight Sun Expresso Stout – a strong and very unique stout with more than a hint of expresso added to the mix – I brought a bottle home with me!!! The Aussies and Asians soon left leaving Amos, Ryan and I to continue the tastings for another 90 minutes or more - tough work, but someone has to do it. He didn't seem like he had anything further to do on a Friday afternoon and we were more than happy to stick around and talk more about the micro brewing business. Another British fella from Manchester named Julian ended up joining us and soon we were all sharing a number of weird and whacky stories and generally having a good laugh. With some reluctance we wished Amos all the best for a busy year ahead, grabbed some bottles of the Expresso Stout to take home with us, and headed out to the Boston Pizza restaurant once again to find us a nice cosy seat in front of a TV to watch the Canucks game. It isn't any wonder that the store does a few million dollars in turnover every year when it's as busy as it was when we arrived. We didn't manage to get seated until about half way through the first period, but then a lovely young lass named Jodi came and looked after us. She was a little flustered to begin with as she seated us (which was understandable considering how busy it was), but what transpired over the next couple of hours was pretty funny at both hers and our expense. We initially ordered some water, a pitcher of beer and some appies which was going to keep us well and truly happy through till the last period of the game. Only one water came out, the beer was fine but we had no plates or cutlery brought to us with our appies so we were a little stuck there too. When we were finally able to get hold of Jodi, we jokingly made out that we were a little upset asking her if she was already having a bad night etc. In actual fact we were more than happy with our beer and hockey and I think she caught onto that fact in the end as she seemed to eventually relax a little. When it came time to order our pizza, however, it started taking a little longer than it normally would and lo and behold Jodi popped up all sheepish to inform us that there had been a mix up in the kitchen and they were only just getting to our order. It took us about an hour to get our hands on our Pizza in the end which was fine. We just ended up having to try and make Jodi feel a little better about the whole situation and reassure her that we weren't upset with her. Then someone else in the store went and told her that Ryan was from head office... the look on her face was priceless. We all had a good laugh about it in the end and I'm pretty sure she got a nice tip from Ryan, so everyone went home happy! And guess what??? Who woke up with a thumping hangover?... yes ME! Feeling pretty rough and having to jump on a plane is not something I wouldn't recommend to anyone. I successfully attempted to sleep through most of the flight, and the fact that I am sitting here typing this out now is testament to the fact that I made it home in one piece in the end. The lovely miss Corrie Miller (Ryan's better half) was even there at the airport this morning to pick us up and deliver me home which was a blessing and yet another thing I am going to owe her for! Ha! What an amazing weekend! 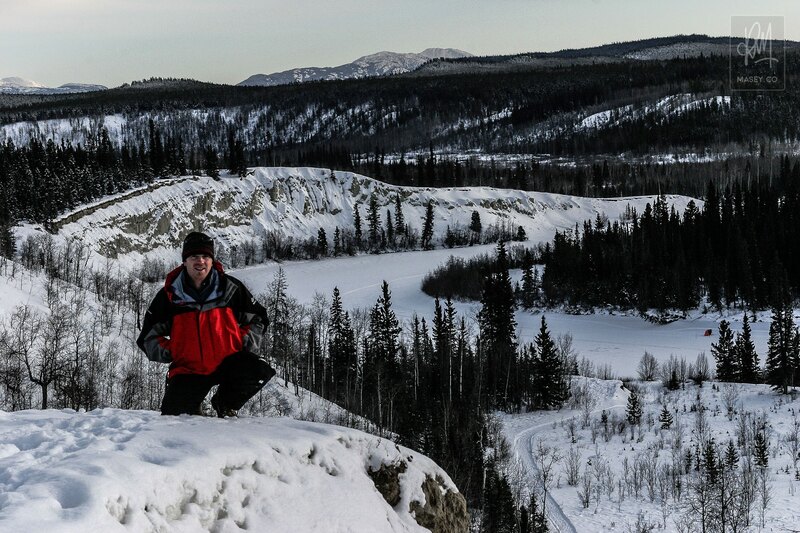 I can't even begin to recommend a trip to the Whitehorse and the Yukon region enough. The people are so friendly and so proud of their town that it just makes you feel good to be amongst them. And with that I will conclude this mammoth post. I'm sick of typing! Haha! So how did Peter Ledwidge go? 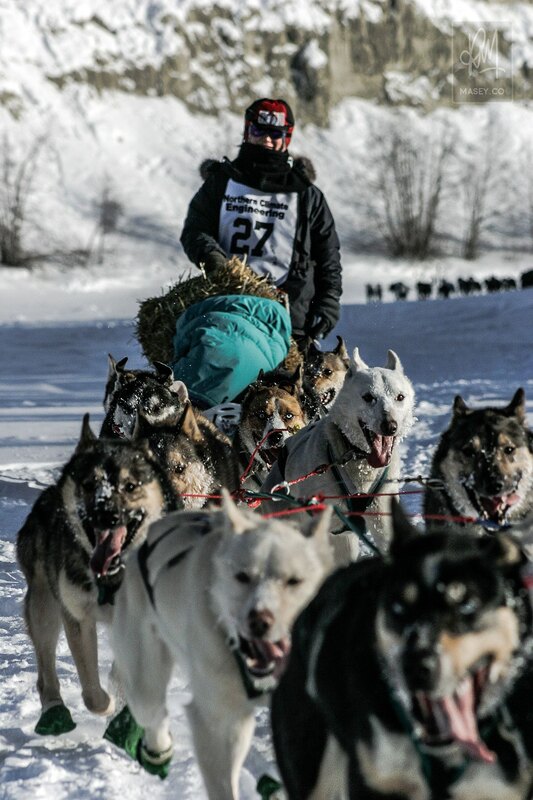 For those of you who are interested I can share that unfortunately Peter and his team scratched from the race at the checkpoint in Circle City, about 260 km northeast of the finish line in Fairbanks, Alaska. 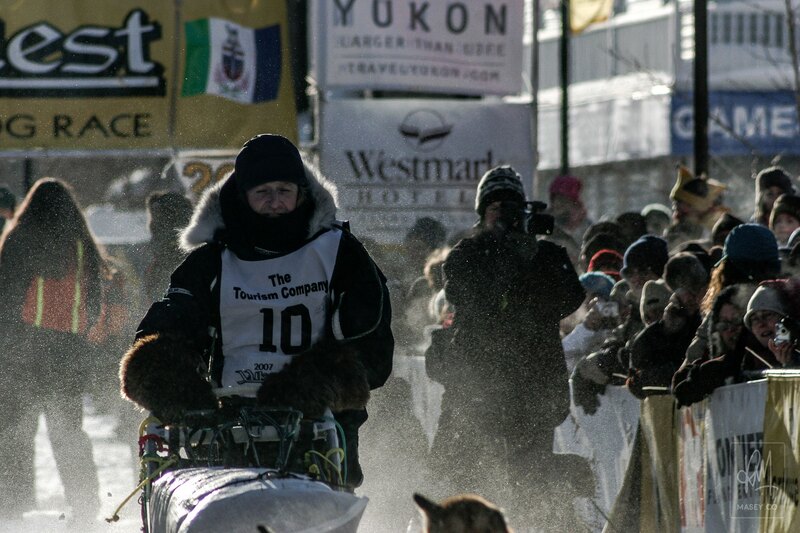 The eventual winner was Musher Lance Mackey who captured his third consecutive Yukon Quest, finishing the race in a mind-numbing 10 days, 2 hours and 37 minutes.